Warm temperatures and extreme weather will thwart agriculture production and threaten U.S. food security, an executive-branch assessment on climate change released earlier this month found. As a result, federal crop insurance programs may serve even greater roles when it comes to farmers’ risk management plans, industry officials say. Read also: "White House assessment warns that climate change means more than drought"
“If that does come into play, I think that just certifies even further that crop insurance will remain as a very, very valuable tool,” said Doug Yoder, senior director of affiliate and risk management for the Illinois Farm Bureau. Put together by hundreds of the world’s leading experts, the National Climate Assessment outlined how climate change will affect the economic, environmental and general well-being of the United States. In a section focused on agriculture, the assessment reported that climate change will cause many regions throughout the country to see declines in crop and livestock production. The United States currently produces about $330 billion in agricultural commodities each year, so even small declines in production could translate into billions of dollars in losses. The National Climate Assessment, released earlier in May, outlined how climate change will affect the $330 billion a year agriculture industry. Additionally, the assessment reported that climate change will boost optimal conditions for weeds, pests and other diseases, making it increasingly difficult to successfully farm. “Climate disruptions to agricultural production have increased in the past 40 years and are projected to increase over the next 25 tears,” stated the 1,300-page assessment. Yet, a Government Accountability Office report released in February last year found that federal crop insurance programs, which protect farmers when nature devastates their crops or when market prices diminish their returns, are not “well suited” to adjust to climate challenges. “Agencies responsible for the nation’s two key federal insurance programs had done little to develop the kind of information needed to understand their long-term exposure to climate change,” the report stated. 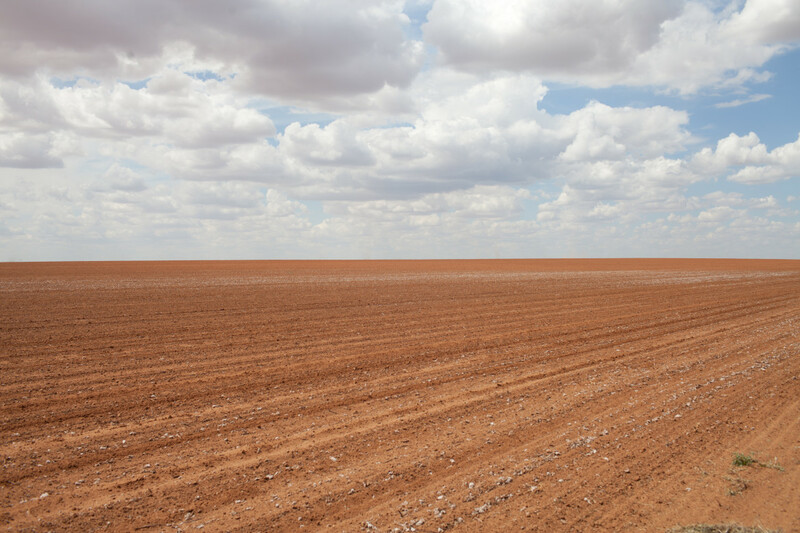 In the 2012 drought year, federal crop insurance data show that U.S. farmers and ranchers received a total of more than $17.4 billion in insurance payouts, also known as indemnities. That total was about $6 billion more than the previous year. Farmers paid more than $11.1 billion in insurance premiums in 2012. However, the government subsidized more than half of that amount. The Environmental Protection Agency predicted that climate change is particularly likely to increase the number of 2012-type droughts in the Midwest. Considering the location of the nation’s Corn Belt, which stretches across the heart of the country from Iowa to Indiana, that could add up to even more crop insurance costs for the government. Illinois farmers received more than $3.5 billion in crop insurance payouts in 2012. They received less than $45 million in crop insurance payouts in 2000. “With the 2012 drought, one of the largest magnitude droughts we’ve ever had, we saw significant claims in Illinois,” Yoder said. Despite warnings from the Government Accountability Office, Congress used the Farm Bill signed into law in February to expand crop insurance programs by billions of dollars. Projections from the Congressional Budget Office estimate the Farm Bill will increase funding for crop insurance by a total of about $5.7 billion from 2014 to 2023. It will expand the programs by $74 million dollars in 2015 and then expand them by hundreds of millions of dollars each year after that. The Government Accountability Office handles the investigation of federal waste and abuse. Besides crop insurance programs, the government administers the National Flood Insurance Program. The National Climate Assessment reported that the annual maximum number of consecutive days with less than 0.01 inches of rain is projected to increase. 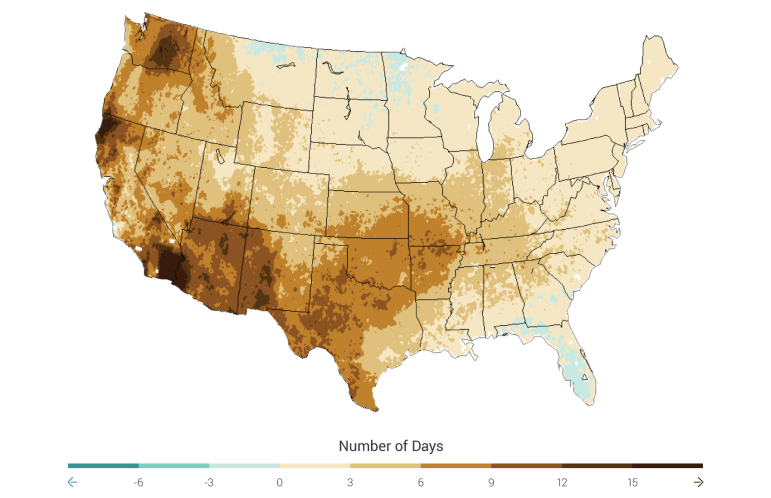 The trend toward more consecutive dry days and higher temperatures will increase evaporation and stress water resources, affecting irrigation, the assessment concluded. The map above shows projections for 2070-2099 as compared to 1971-2000 under an emissions scenario that assumes continued increases in heat-trapping gases. Besides the National Climate Assessment, data collected by the National Aeronautics and Space Administration show that global surface temperatures in 2012 were the ninth warmest on human record. The Intergovernmental Panel on Climate Change, an international research coalition tasked with evaluating climate change phenomena, also predicted that temperatures will rise by as much as 10 degrees Fahrenheit throughout the next century. That increase would make summers in northern states such as Michigan, Wisconsin and Illinois feel much more like summers in Texas. 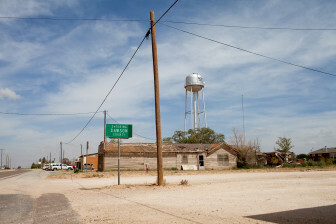 Downtown Ackerly is a town in the heart of West Texas cotton country. If climate change projection hold true, future summers in Illinois could soon feel more like current summers in Texas. Consequently, climate predictions and crop insurance data suggest that climate change will change where crop insurance money is going. As northern regions get hotter, farmers will plant crops that were once ill-suited to their area. That idea is already demonstrated by the influx of North Dakota farmers that have only recently started planting soybeans. Soybeans in North Dakota were virtually nonexistent before the 1980s, Rippey said. But as the state’s climate turned warmer and wetter, there was a dramatic expansion of the Soybean Belt into the state. 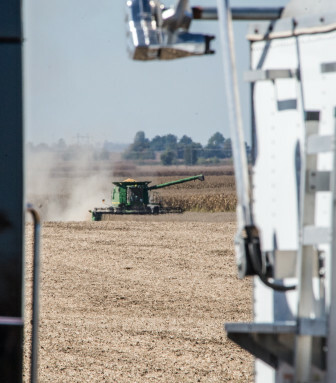 “Now we see on average something around the order of three and a half to 4 million acres every year devoted to soybeans in North Dakota,” Rippey said. North Dakota insured less than 1.8 million acres of soybeans in 2000. That number more than doubled to 4.6 million acres of soybeans in 2012. Read also: "Climate change threatens crop insurance costs; Farmers struggle with GMO seeds"
During that time, government subsidies to help North Dakota farmers pay insurance premiums on soybeans increased from about $7.4 million to more than $126 million. Insurance payouts more than tripled.